In the interest of Public Health, Health & Safety and the cleanliness of our pool water, appropriate swimwear, made of Polyester or Nylon, must be worn at all times when visiting Sandcastle Waterpark. Guests are not permitted to wear outdoor clothing or footwear of any kind in the pools or on slides. Our swim shack has a wide range of swimwear and towels to hire and purchase. External clothing is NOT permitted in any of our pools. In the interests of health and safety and providing the best standards of hygiene, guests wearing anything deemed to be classed as non swimwear will be asked to change. Please ensure you read our policy below relating to swimwear. 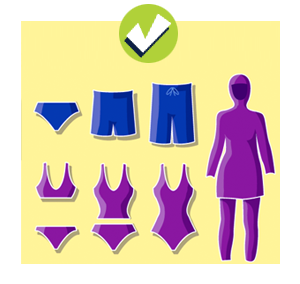 Appropriate swimwear includes the following: swimming trunks, swimming shorts (including knee length shorts e.g. board shorts), swimming costumes, swimdress, bikini’s, tankini’s, burkini’s, Hijoods (or other similar swimwear). N.B. Under certain circumstances close fitting plain t-shirts may also be worn at the discretion of the Waterpark Supervisor. 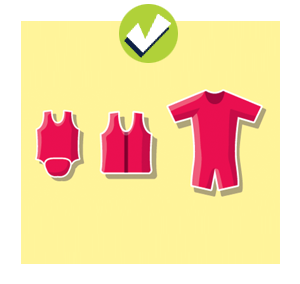 For under 5’s, to help maintain body heat without restricting movement, the following swimwear is also permitted: Neoprene Baby Wraps, knee-length suits, float suits or neoprene “float jackets” (N.B. Longer than knee/elbow length wet suits are not permitted). Inappropriate swimwear includes the following: Underwear, transparent costumes or thongs (or anything with obscene or offensive pictures or slogans), sporting wear, denim or cotton leggings/leotards, long flowing clothes, baggy t-shirts, swimwear with protruding designs or accessories that could be abrasive to other swimmers and our slides and attractions e.g. pins, rivets, buckles, zippers, buttons etc. Long necklaces, chains and jewellery should also be removed. Sandcastle Management reserve the right to determine whether or not swimwear is appropriate. Regular nappies are not permitted in any pool (swim nappies are available for purchase at reception and the Swim Shack). Guests who do not wear appropriate attire will be asked to change. The wearing of spectacles is not permitted unless on lanyards (lanyards are available at reception and the Swim Shack) N.B. Spectacles are not permitted whatsoever on the Duelling Dragons or Montazooma speed slides. For health and safety reasons and also to prevent possible tarnishing, jewellery should not be worn in the pools, or on the slides and attractions. N.B. Please ensure your swimwear is suitable for our water disinfection chemicals and is durable for use on the slides. Unfortunately, due to the nature of slide riding, we cannot accept responsibility for damage to costumes particularly if the slide rules are not followed. NO costume? NO problem! We have a selection of swimwear for hire or purchase in our Swim Shack. Hire prices are £3.50 for an individual item (£5 refundable deposit required) or £5 for 2 items (£10 refundable deposit required).